In the early twentieth century, sturgeon Acipenser sturio was largely present in the estuary of the Gironde, Dordogne and the Garonne where females went back to spawn. The Legend said that a Russian Princess, crossing the Gironde, was horrified to see that the fishermen kept the fish while the eggs were roughly thrown into the sea or given to the ducks! She explained that in her country this dish was sold very expensive and fishermen were amassing real fortunes. 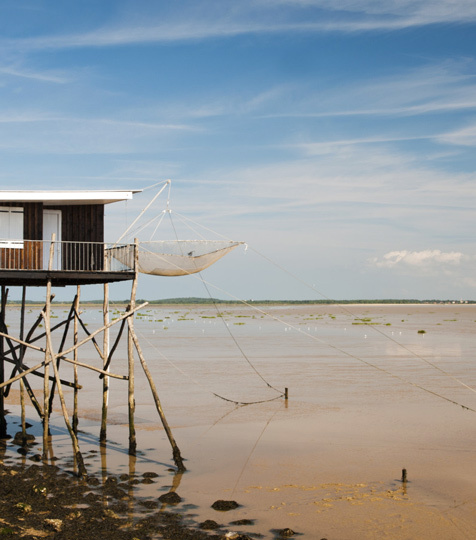 Thus, in 1920, starts caviar production on the right bank of the Gironde , up to nearly 5 tons per year! Unfortunately, the sturgeon will be caught indiscriminately, leading to a gradual disappearance in the waters of Gironde ... Finally, the fishing was completely prohibited in 1982. In parallel, the Cemagref Bordeaux (Centre of Agricultural Machinery, Rural Engineering, Water and Forestry), is launching a program to repopulate the area with sturgeons. For this, it requires the efforts of experienced fish farmers, including Sturgeon society to try to breed and reproduce in captivity Siberian sturgeon specimens, the Acipenser baerii. We should no longer be afraid to admit that although wild caviar from Russia, Kazakhstan, Iran and Armenia made caviar's reputation, this era is now over. A victim of over-fishing and smuggling, wild sturgeon is now protected and the sale of its caviar has been banned since 2008. France pioneered sturgeon farming and has emerged as a major producer on the world caviar market. Some 25 tonnes of caviar are produced in France every year, which is highly prized by the world's top restaurants. The Aquitaine region, which produces almost 24 tonnes a year, is at the centre of this production. Six of the eight French caviar producers – including Sturia – are located in this region. Delicious, refined and produced with genuine expertise, Aquitaine caviar’s reputation grows every year. In the face of growing international competition (especially from China), the region's producers joined forces to set up the Association Caviar d’Aquitaine (an organisation to manage and promote the origin of their products) in July 2013. But they didn’t stop there! In November 2013, the association officially registered the 'Caviar d'Aquitaine' collective trademark with a view to obtaining PGI (Protected Geographical Indication) status, just like Marennes d’Oléron oysters and Côtes d’Armor scallops. This 'Caviar d'Aquitaine' PGI, based on the region's genuine legitimacy as the historic cradle of French caviar, should help defend and promote the traditional expertise resulting from over twenty years' experience. This long process is expected to conclude with some very strict specifications being issued in 2017. These will form the basis for protecting the caviar’s famous quality. The collective trademark covers the geographical area of 'new' Aquitaine. The fish are born and farmed in this geographical area and come from spawners themselves farmed in the same area. The fish are therefore born, farmed and killed in the Aquitaine region. Their eggs are also processed in this area. This gives strict traceability at every step of the egg to egg process. It guarantees constant quality control and highlights producers' expertise and know-how throughout the food production chain. Aquitaine caviar comes from unfertilized sturgeon eggs of the species Acipenser baerii. The oocytes are dry salted (low concentration), with or without preservatives. Importantly, these are natural quality, untreated eggs. In other words, they are non-ovulated and/or unpasteurized. The fish environment complies with high quality standards (saturation, pH, flow, density). Sturgeon are fed on granules (containing plant and fish proteins). Their feed must not contain any GMOs or PAPs (Processed Animal Proteins).